Please be aware that what I have to say is nothing personal against Josh del Sol or anyone else featured in the youtube. I have no personal grudges or axes to grind. But I do have a working BS detector. Josh is a good filmmaker. Take Back Your Power was a great, fact-based tool for awakening people. But this one — and I will back this up with specifics — is propaganda. I would love for the theory it espouses to work, but I don’t think it will or has. I am going to go through the YouTube InPower presentation now in the order that various things were presented. The video gets off to a bad start when Cal Washington makes the point that one of the basic InPower premises is that, by switching to smart meters (SMs), the utility has changed the contract they have with you. That’s both right and wrong. Technically he is right because what they have installed is not a meter. It’s a transceiver and computer. I have made that point repeatedly here in AZ for years. I have proved it with an exploded conceptual rendering of a SM from Lawrence Berkeley National Laboratory that shows metering to be 1/5 of what a SM is. I have proved it by providing documentation that the IRS classifies smart meters as computers. I have proved it by providing the Congressional testimony of utility exec. Bennett Gaines saying SMs are computers. But guess what? In the “real” world, to the utility and PUC type people, it’s a meter. They won’t budge off that. If you accept service from the utility, you accept their equipment. Period. Cal says that Kevin Lynch resigned on the day he got a Notice of Liability. This is supposed to be huge because Kevin holds the most senior non-political office in the gov. of Canada, Clerk of the Privy Council. Now this is something we will see throughout the YouTube: A news article is put on screen (11:17) and most of it is greyed out, with what Josh wants to emphasize lightened up and highlighted. But if you read the grey it says that “there has been much speculation in the civil service that he wanted out.” From my perspective, that’s a lot different than Cal’s exclamation at the end of the sequence that “He ran!” And again, this is something we will see a lot of in the YouTube: Drawing a false cause and effect relationship between Notices sent and people resigning or not seeking re-election. What we should be looking at is if policy changes, not if someone resigns or does not seek re-election. Carol Taylor — Another person who resigned, supposedly because she received a Notice. But if you read the greyed out part the reason given is “So she can focus on her new job of chairing a federal economic advisory panel.” She has not been knocked out of the game. People like her make those kind of career moves all the time. Cal talked about a judge he had running out of the courtroom. The bailiff (or sheriff or whoever was running the court) then says “All rise. I guess we’re having a break.” The problem is, Cal just leaves it at that. What happened after the break is not divulged. Outcome of the case not divulged. Maybe the Judge had a bathroom emergency. Who knows? One upshot was that Cal got arrested a year later, that he made sound as though it was some kind of revenge (and may well have been) for driving without insurance, and he spent 60 days in jail. Cal then talked about what happened after he got out and went to court again. Long story short, we are titillated with a $300M demand he put on the judge but the outcome of that is not divulged. It is left open ended. We don’t know what happened. And I don’t know about you, but I have better things to do than spend 60 days in jail. I’ve been there a couple times overnight. That was enough. Kevin Falcon, is given as another example of someone who stepped down. What really happened in the greyed out bit is that he announced he was not going to seek re-election. As part of that announcement he did “step down” from some posts he held. But he did not quit altogether. The last line you can see on the screen is that his reason for not seeking re-election is “he and his wife are expecting.” Since the next line is not seen, I can only assume they are expecting a baby. What else would they be expecting together? A new car? Cancer? A Notice of Demand? I don’t think so. People resign all the time for family changes. Next, examples of results of specific “seed groups” utilizing the Notice theory are presented. Kelowna, BC action — The SM installer company CEO resigned on the day he got a Notice of Default, and Chair of the BC Utilities Commission who also got the same notices resigned. That sounds impressive but did SM policy change? No. Did the installation company fold up shop and stop installing SMs? No. Seattle — same thing. People did not seek reelection and a couple of people resigned but did policy change? No. And BTW, people resign and don’t seek reelection all the time. Since I have been on the ACC’s case here in AZ (6 years), the ACC Executive Director resigned. 2 Utilities Division Directors have resigned. The so-called “Ethics Officer” resigned. Other various people there have resigned. Was that because they got Notice letters? No. Was that because I was such a relentless PITA? No. They resigned for a number of different reasons. A couple of them went to work for APS. Oh, and the Exec. Director of the AZ Dept. of Health Services, the guy who was in charge when the fraudulent SM health study they did came out, also resigned. Was that because I savaged his stupid SM study? No. Was it because he got a Notice? No. He moved on to a university teaching gig in Tucson. People do get sick of Phoenix. People do make career changes. MI — AG Bill Shuette calls for free right of SM refusal after being sent the Notices. Total nonsense. Schuette has been hip to the SM scam since at least 2012! At the bottom of this email I reproduced the statement he issued in 2012. About 4 people at the MI PUC are no longer listed at the website. Big deal! See my point above about the ACC resignations here. Happens all the time. If you read the greyed out part, you can see that the Warren city attorney statement was taken out of context. Josh made it sound like he resigned and in so doing blew the whistle on DTE’s campaign donations. Campaign donations are a matter of public record. I look up APS’s all the time. It’s not major whistleblower stuff. The point the Warren city attorney was making (again, in grey) is that, for people who want to change SM policy there are steps that must be taken, and that some venues are appropriate and others aren’t. In his opinion for example, the Council can’t do it. Also, DTE is the beneficiary of a certain law which he cited and then, saying that the law could be changed, he mentions that would be hard because of DTE’s campaign donations. That’s not whistle blowing. It’s a statement of political reality. In short, the city attorney was being frank. 13 people have saved their analogs. That’s great, but for how long will that last? Were they given any guarantees? If they wrote Notices, where are the responses? Also, there’s a lot of people in MI who held on to their analog meters — until they didn’t. In other words, they were defiant and that worked for quite a while but eventually DTE came around to either cut them off or install a SM. If the 13 Josh mentioned still have their analogs a year or 2 from now, then I might be convinced. NY — The speaker says he sent a $300M liability letter to not have a “smart” water meter and got a letter back saying “We’re sorry; you don’t have to have one.” But would he have gotten that letter anyway had he written something less shrill? The details of how to refuse a SM in his location are not provided. Were the meters mandatory? We don’t know. Maui — This is another false cause and effect. The electric company switched from wanting to blanket the islands with “smart” meters to an “opt in” proposal. That was actually the result of the PUC rejecting the company’s huge proposed budget. The company had to make cuts. Blanket “smart” meter installation was one of them, but it remains a long term company goal. Also, that decision was made well before any Notice letters were sent out. Lastly we get the voice of a “utility insider” who says that his utility has a “war room” dedicated to keeping track of SM resistance. Big deal. Of course they do! Josh is flattering himself if he thinks that’s the result of Notice letters being sent out. I am sure just about all the utilities have war rooms or at least have someone whose job it is to keep track of resistance. I know for a fact for example that APS has pictures of my meter cage. Does anyone think these companies just sit on their thumbs in the face of a threat like SM resistance of any kind? PG&E had VP “Ralph” infiltrate some anti-SM chat group years ago. In response to her request not to have a transmitting gas meter, someone I know actually got an email from UNS gas here telling her she’d been “brainwashed by Warren Woodward.” So of course these companies are keeping track of us, Notices or no Notices. Given the questionable benefit of smart meter program to customers, as well as the extensive public concern about the effect and potential intrusiveness of smart meter infrastructure acknowledged in the Commission’s January 12, 2012 Order in this matter, the Commission appropriately directed Michigan’s electrical utilities deploying or proposing to deploy smart meters to provide information about their plans for allowing customers to opt out of having a smart meter, and how they intend to recover the cost of such an opt-out program. The Attorney General respectfully submits that utility customers should be given a meaningful choice of whether to have smart meters installed and operated on their property. An “opt-out” program that requires those customers who opt out to pay an unwarranted economic penalty for doing so does not afford customers such a meaningful choice. The information provided by Detroit Edison, and Consumers [Consumers Energy Company] in response to the Commission’s Order does not sufficiently establish that they intend to offer customers a fair choice of whether to accept smart meters on their property. Detroit Edison’s response on this subject is based upon the assertion that “Edison’s AMI [Advanced Meter Infrastructure] program is beneficial for all customers.” (Document No. 0148, p. 7). Proceeding from the unsubstantiated assertion, Detroit Edison apparently proposes to impose what it broadly describes as “all incremental costs” solely upon customers who choose not to accept installation of smart meters. (Document 0148, pp. 8-9). Consumers’ submission similarly states that while it proposes to provide customers with the option to retain their existing meter equipment, it apparently intends to subject customers making such a choice to additional charges, including charges for “maintaining ready testing and billing traditional meters”. (Document No. 0146, pp.16-17). While neither Detroit Edison nor Consumers provide details regarding their opt-out proposals and associated charges, both of their comments suggest that they intend to effectively penalize customers who choose to opt-out of smart meters. Presumably, under the utilities proposals, customers who opt-out of smart meters would be required to pay rates covering both the costs of the smart meter program, and expansively defined incremental costs “of retaining traditional meters. These proposals raise substantial questions as to whether their respective customers would, in fact, be afforded a fair and meaningful choice to “opt-out”. Another argument which may be important for the Commission to consider is whether a financial incentive to homeowners who allow smart meters to be installed in their home might be an alternative approach to a rate increase if a homeowner refuses to permit a smart meter to be installed. We are nearing a moment in history that we have all been waiting for – hearings at the Michigan House of Representatives Energy Committee on an analog meter choice bill that could move the bill out of committee and onto the House Floor for a vote. The bill is HB 4220. 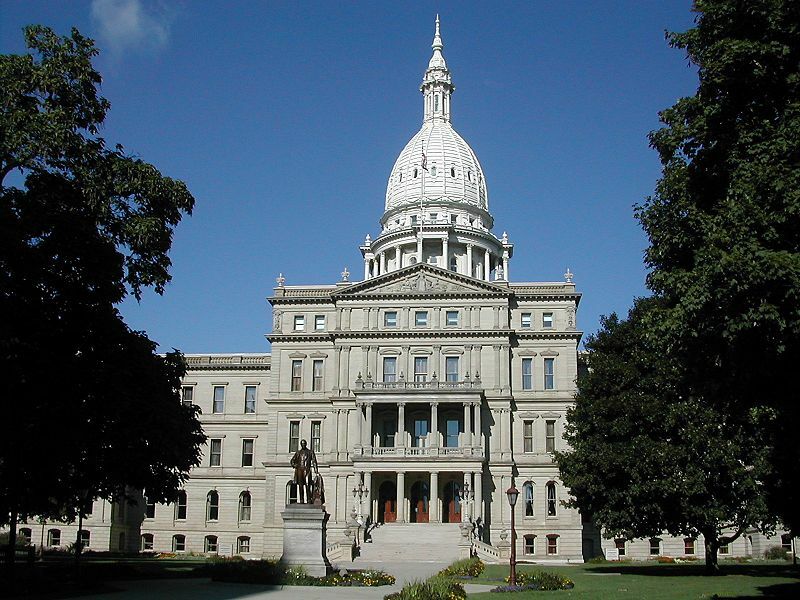 The hearing is this coming Tuesday, February 21, at 9:00 AM in Lansing in the Anderson Building, 5th Floor. The positive momentum is due to the efforts of several of our legislators, legislative staff, and the legislative service bureau. In particular, we are very grateful to Representatives Glenn, Lucido, Howrylak, McCready, Barrett, Liberati, Zemke, Runestad, Hernandez, Allor, Kelly, Canfield, Noble, Hornberger, Hoitenga, Wentworth, Garrett and Robinson for supporting and sponsoring the bill. We are also grateful to Nancy Bareham, aide to Representative Kelly, for her hard work, and to Senator Colbeck for his support on the prior bill, HB 4916. PLACEMENT OR USE OF A TRADITIONAL METER OR AN ADVANCED METER REGARDLESS OF THE UTILITY THAT PROVIDES SERVICE TO THAT CUSTOMER. “TRADITIONAL METER” MEANS AN ANALOG OR SIMILAR METER THAT IS UNABLE TO TRANSMIT USAGE INFORMATION AND IS ONLY INTENDED TO BE READ BY AN INDIVIDUAL THROUGH A VISUAL DISPLAY. A TRADITIONAL METER IS NOT DESIGNED TO BE AND IS NOT CAPABLE OF TRANSMITTING USAGE DATA BY USING RADIO WAVES OR BROADBAND OVER POWER LINES, ALLOWING 2-WAY COMMUNICATION BETWEEN THE METER AND THE UTILITY OR ITS AGENTS, OR ALLOWING A UTILITY OR ITS AGENTS TO CONTROL A CUSTOMER’S THERMOSTAT, APPLIANCE, OR SERVICE. A TRADITIONAL METER DOES NOT INCLUDE AN ADVANCED METER THAT HAS CERTAIN FUNCTIONALITY TURNED OFF OR DEACTIVATED. We interpret above sections together as giving utility customers the analog meter choice we want for the meters placed on our homes. Please join us in the effort to get this bill passed. We need every voice to support this bill in its entirety at this moment in time. We cannot afford at this moment in time to pick and choose different language, or interpret it negatively. We need positive support, positive momentum, and a positive outcome. For that to happen, we need every voice to support our legislators and those who are helping them. Please call your representative and tell them that you support HB 4220, and either thank them for their support, or ask them to support it as well – 100%! THANK YOU! Revised 11/16 to add critical location information. November 15th, 2014 – Finally, a committee of the Michigan legislature will hear our smart meter protests! On Tuesday December 2nd the General Oversight Committee of the Michigan House of Representatives will listen to our grievances concerning DTE and Consumers smart meters and how we have been treated when we sought help for these concerns from the Michigan Public Service Commission. Come and plan to speak for 3-5 minutes before the Committee, chaired by Tom McMillin. The hearing will take place in the Anderson House Office Building at 124 North Capitol Avenue (directly across the street from the Capitol building). Ask the guard in the lobby to direct you to the appropriate floor and room number for the House Oversight Committee meeting. The hearing will begin sometime between 3 pm and 4:45 pm, depending on when the legislative session ends. Tom has assured us that this hearing will run as long as necessary to give every person a chance to speak for the record! Hearing may run late into the evening. We particularly want your testimony on the record if you have been made ill by a smart meter, can no longer sleep in your own bed, had your power shutoff or been threatened with shutoff of your power for refusing to take a smart meter. Your input also needed if you have sought redress for any of these grievances from the Public Service Commission and been denied their help! The Chairman of the Public Service Commission has been invited as have representatives from DTE and Consumers Energy. We are hopeful that large numbers of you will come and make your voices heard! If you have doctor’s letters or other written evidence you want submitted to the record, please be sure to bring 15 copies 30 copies for submission to the Committee. The Purpose of this Hearing: Everyone should understand that the McMillin smart meter bill is still stuck in the House Energy Committee and will almost certainly die at the end of the year. This hearing, on the other hand, will be about establishing a record of evidence concerning the smart meter issues and the failure of the Public Service Commission in addressing those issues. It has at least the possibility of leading to bills to be introduced in the next session of the legislature beginning in January. It is also a good opportunity for us to get our concerns reported by the press. Other Activities Planned for That Day: If you are planning on coming for the hearing you may also want to come earlier in the day and join us for other protest activity planned by Pam Wallace and Dee Hilbert. If you come at noon that day you can join us for a demonstration in front of the Capitol building. The Capitol building is at 110 South Capitol Avenue (at the corner of Capitol Ave and Michigan Ave) Please bring a sign and wear warm clothing. In the morning some of us will be in the Senate lobby having our Senator called out of session by the Sergeant at Arms to talk with us about smart meter legislation. In the early afternoon some of us will be in the House lobby having our Representative called out of session by the Sergeant at Arms to talk about smart meters. If you plan to join us for the full day of activities please be sure to bring water, food and a snack. Tom is arranging for us to have a room in the Capitol building to gather during the day. The room will allow us to rest, warm up and visit during our time at the Capitol. Michigan Wants An Analog Opt-Out Too! What Are You Going To Do To Help Us? When Are You Going To Help Us? Smart Meter Radiation As a Type 2 Carcinogen. They Are Not Safe. In our September 29th post titled “How To Be Heard On Our Health Complaints” we announced a national campaign in coordination with the California based national website stopsmartmeters.org. In addition to that group we wish also to thank smart meter groups in Indiana, Wisconsin and Florida (and perhaps others) for featuring this campaign on their sites. In our earlier post we urged all of you who are experiencing smart meter related health symptoms to get diagnosed by your doctor and ask him or her to write you a letter expressing professional judgment that a smart meter is causing your symptoms or is aggravating a pre-existing health condition. If you were successful in getting diagnosed and have obtained such a letter we are asking that you write your own letter to your representative in the Michigan State Legislature and attach a copy of your doctor’s letter and MAIL THESE ON OCTOBER 25th FOR GREATEST IMPACT! When you do so please send us a copy to one of the addresses below so we can keep track of the growing body of evidence that may be needed for our further efforts going forward. WHEN A GREAT MANY OF THESE LETTERS, ALL BACKED UP WITH MEDICAL DIAGNOSES, HIT OUR LEGISLATORS ALL AT ABOUT THE SAME OUR VOICES WILL BE HEARD! Most doctors will require you to sign a HIPAA authorization before they will provide such a letter. The authorization can be limited to the release of the letter and not be inclusive of test results or other medical records. We realize not all of you will have been able to get a proper diagnosis of your condition. Many doctors did not acquire, as part of their medical training, the expertise to recognize and treat complex health symptoms that are caused by electromagnetic radiation. They may recognize the symptoms but ascribe them to other causes. Many of them are gun shy about getting too far out front on this issue until the cause and effect mechanisms are more widely accepted in their profession. If you have not yet managed to get a diagnosis or a letter do not be discouraged. We will be providing more information about how to go about this in a future newsletter and will no doubt do a repeat of this letter writing campaign. If you did get a diagnosis and a letter from your doctor we would like to hear your story. Please mention any diagnostic test your doctor used to establish electro-sensitivity. Did your regular doctor refer you to a specialist? If you tried but have not been able to obtain your doctor’s cooperation, we would like to hear your story too. Were your symptoms ignored or attributed to other causes? As we accumulate more information along these lines we may be able to offer more guidance to our readers as to what approaches work best. Please email a blind copy of your letter and your doctor’s letter to our National Coordinator, David Lonier at davidlonier@gmail.com. Or send snail mail to David Sheldon at 215 W. Troy #4004, Ferndale, MI 48220. If you have questions about this campaign, please phone David Lonier at (248) 373-9111 or Michigan Stop Smart Meters at (248) 604-7545. Link to our September 29th post on this campaign. Update on this story at this link: Day of Action! We need to reach decision makers in all the states – legislators, judges, health care providers. To do this we need medical documentation of symptoms or illnesses caused by “smart meters”. Personal testimonials will not be enough. WE THANK ALL OF YOU WHO RESPONDED TO OUR PREVIOUS APPEAL! BUT WE NEED MUCH MORE OF THIS KIND OF EVIDENCE! (2) That you have a medical condition that, in the doctor’s judgment, would be aggravated by having a smart meter on your home or place of business. Be sure your doctor knows what you are doing and has consented to do so. That is important!!! If the doctor is called upon, they can support your health claim and this will greatly assist with abating the smart meter and keeping your analog meter!! We can’t wait for the 1st person to die! Once you have such a letter from your doctor we are asking you to write your own letter to your state representative or state senator but, for maximum effect, hold off mailing it until October 25th! This is the DATE when your letter or e-mail will go out! Those that have not yet participated, this is the time and day for you. Those that have already done so, you do not need to do anything except spread the word…. In your letter or email describe your symptoms in your own words, why you believe a smart meter caused these symptoms and what action you would like your representative or official to take. Then attach a copy of your doctor’s letter. Medical records or test results need not be attached. Also please send your own letter with copy of doctor’s letter attached to your state’s governor and your state’s attorney general and ask him or her to take all action within their power to address this situation. Finally, it is important that we have some way to keep track of how much evidence is being accumulated. We want to leverage this evidence in followup communications to other decision makers. So we ask you to email a blind copy of your letter and your doctor’s letter to our National Coordinator, David Lonier at davidlonier@gmail.com. As these letters are being supported by your doctors and are sent to your Representatives, Governor and Attorney General, they will never again be in a position to argue that they had not been presented with hard evidence to back up the health claims. Please feel free to share this email with other website advocates who can help support this project. We can’t wait for the abusive deployment and then try to fix this problem with a band-aid. Michigan Stop Smart Meters at (248) 604-7545. A Message to All of Our Michigan Friends, from the Cusumanos – Two of Our Strongest Fighters!!! Everyone’s hard work has been incredible and awareness to the smart meter issue is continuing to grow! But once again, your help is needed! Our work is not done! Numerous individuals have stood up and reported their adverse health affects since the smart meter deployment. This came from many citizens and ratepayers alike. Numerous individuals went before the “Public Service Commission” and observed them turn a blind eye to your concerns, and it all fell on deaf ears. That’s not the case any longer. We have watched you in different avenues present your concerns and you have been great spokespersons for “the people”. This is the DATE where all advocate groups will have their followers send out an email! …. It is time once again to bombard your Legislatures (in your district) with hard evidence by all parties experiencing an episode of adverse health effects, AND, IT MUST BE SUPPORTED BY YOUR MEDICAL DOCTOR WHO WILL CORROBORATE YOUR ILLNESS in writing. Without a letter from your doctor, our lawmakers, will not have the necessary tool to take on the energy providers. Doctors have the expertise to make a diagnosis, we as patients do not. It is not enough to simply assert a cause and effect; we need the medical documentation to be taken seriously. Your doctor needs to write a letter for you and you need to attach that letter along with your personal letter to your Representative & Senator. Be sure your doctor knows what you are doing and he has consented to do so. That is important!!! If the doctor is called upon, they can support your health claim and this will greatly assist with abating the smart meter and keep your analog meter!! We can’t wait until people die! When you send a letter or email to your representative, please email us a blind copy us so we can keep track of how effective this campaign is!!! As these letters are being supported by your doctors and are sent to your Representatives and Senator, plausible deniability NO LONGER EXISTS. These health claims are substantiated and documented by medical doctors. This is the “date” that WE KNOW the public is being heard once again….It is a date known in all states by all advocates and awareness groups that they have been heard. Leadership can not assist us unless we assist leadership with our statements of fact in objection, corroborated by their doctors, and the ill-effects they have had since being exposed to the smart meter installation!! Will you help??? Please respond to us and let us know that you can help and consolidate everyone’s efforts across the USA.. “WE the People, BY the People, and FOR the people. Please feel free to share this email to other website advocates who can help support this need. We can’t wait for the abusive deployment, and then try to fix this problem with a band-aid. NOW IS THE TIME TO STOP IT! 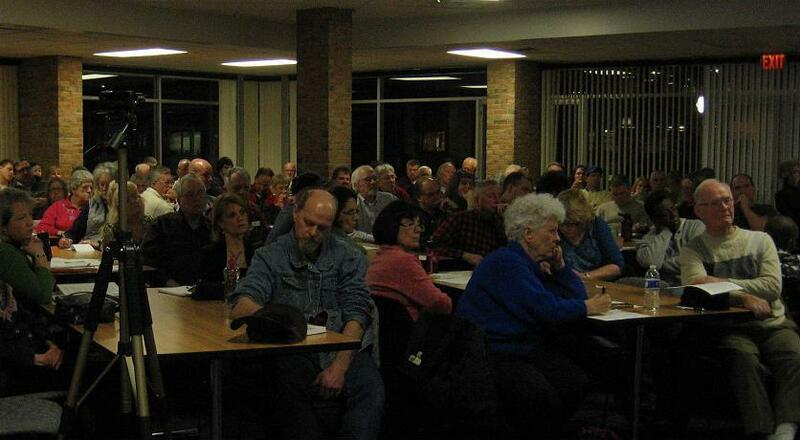 February 21st, 2013 – Muskegon Smart Meter Meeting – Standing Room Only! 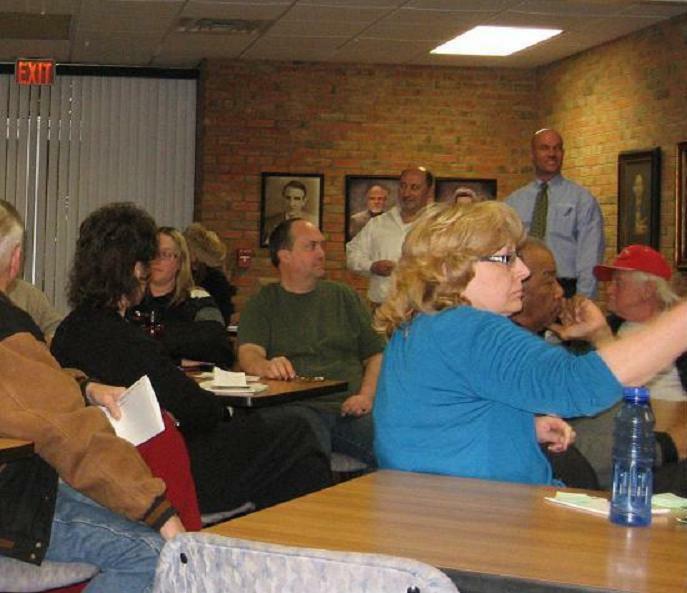 Ond hundred twenty five people came to hear our program on the dangers of electric “smart meters” currently being installed in Muskegon and Oceana counties by Consumers Energy. 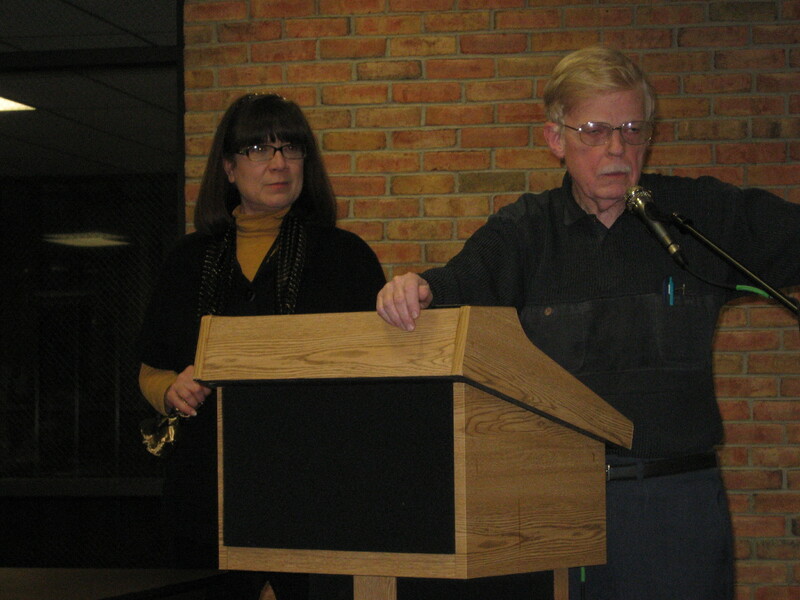 Our meeting at the Muskegon Community College in Muskegon MI, featured historical overview and privacy presentations by David Sheldon and a very detailed discussion of the radiation and health issues by Diana Ostermann. Dennis McKee and a colleague were in attendance representing Consumers Energy and made a brief statement following the formal presentations. The meeting ended with a lively question and answer period with questions both for the speakers and the Consumers representatives.